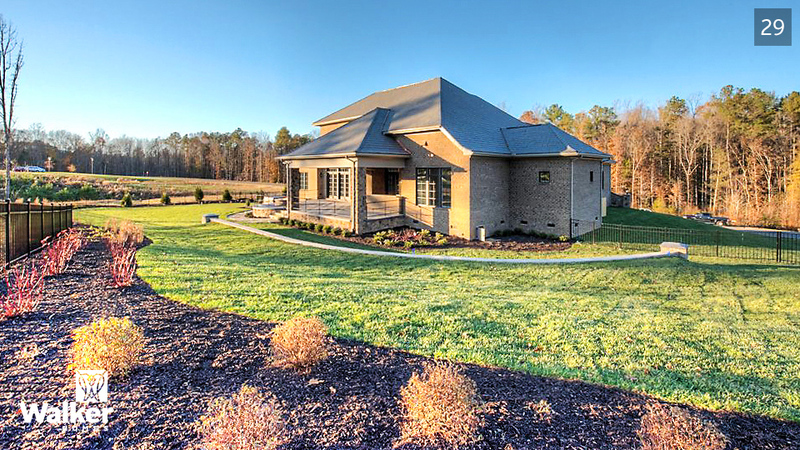 We recently completed the Harvill Residence, a custom home built just off the first tee of The Federal Club—an Arnold Palmer-designed golf course in the Mountain Run community. I’d like to share a few photographs we captured just before handing the keys over to the Harvills. Barb and Glenn Harvill were a joy to work with—ideal clients with a clear vision for their property but open to the creative contributions of Architect Mike Foltz and Interior Designer Debbie Casey. Walker Homes Supervisor Maurice O’Donovan orchestrated the many hearts and hands necessary to bring their vision to life. 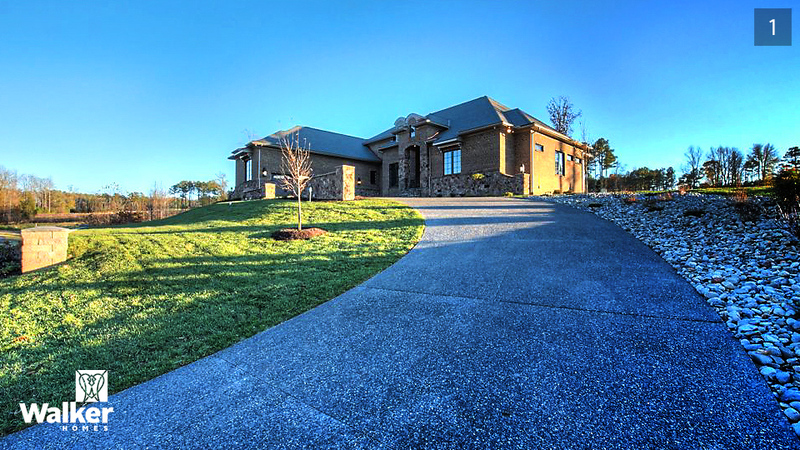 1 | The first image shows how the home is sited on the hill crest in a picturesque setting near the golf course clubhouse. Maximizing the views from inside and moderating the incline from the street required grading almost 7 feet off the hilltop. 2 | The one- and one-half story home—the second floor is roughly half the size of the ground floor—is a generous 5800 square feet. 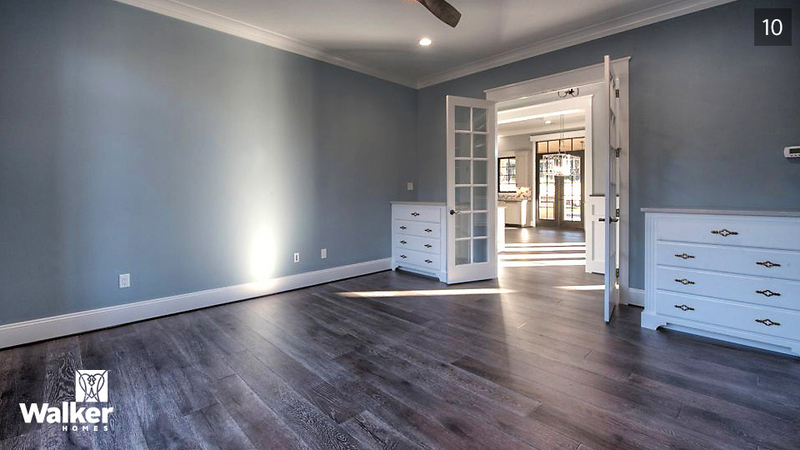 The style is French Country, complete with curved rafters and barrel dormers, but the materials and our customers’ design input make it one-of-kind. Our favorite Andersen divided-light windows bring the outside in and lock UV and weather out. The windows and garage doors are pre-finished in bronze to match the exterior brick and stone tones and ensure a minimum of maintenance. Ecoshake’s simulated cedar-shake roof tiles provide visual interest and a truly permanent roof. 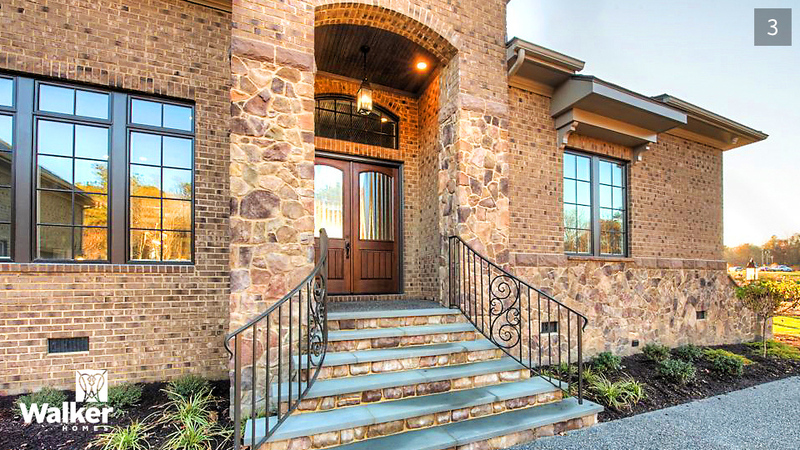 3 | The entrance features a lovely flared-stone staircase with custom-designed iron railings and a dramatic portico finished in Eldorado Stone’s Country Rubble stone veneer—which ensures color-consistency in a long-lasting, virtually maintenance-free finish. 4 | As you enter, the striking barrel-ceilinged foyer introduces the home’s primary design elements and color palette. 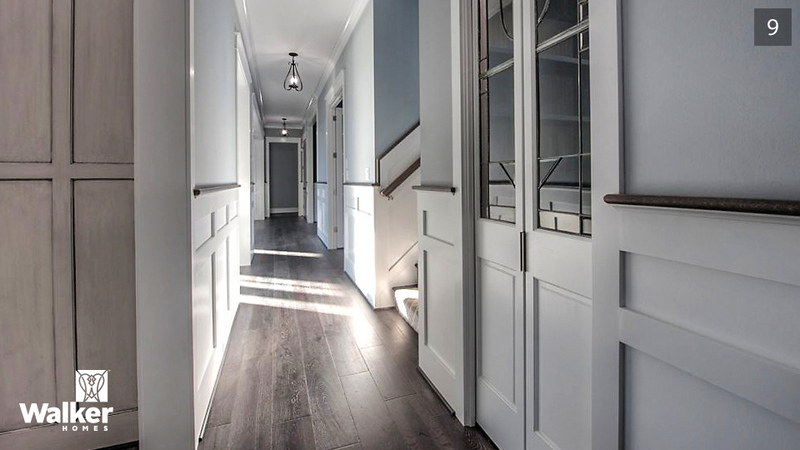 It’s all about the details: oak trim that tops off the wainscoting is stained to match the random-width wood flooring and repeated in the entry doors and ceiling. 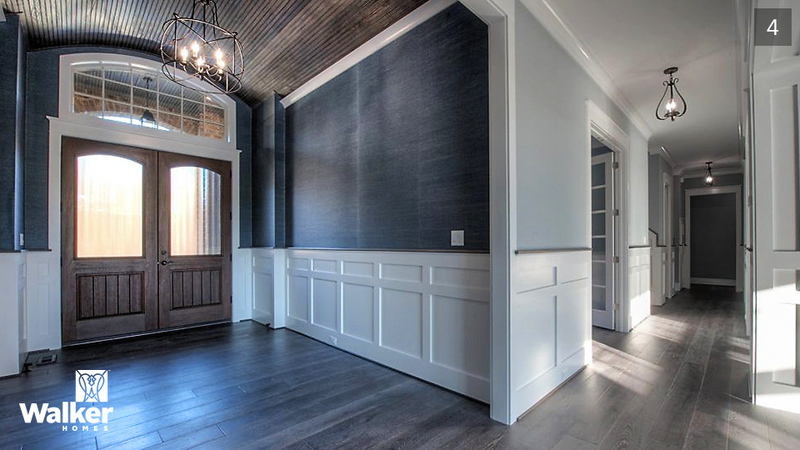 The rich, deep-blue grass cloth that covers the foyer walls contrasts with the clean white, flat-panel wainscoting. 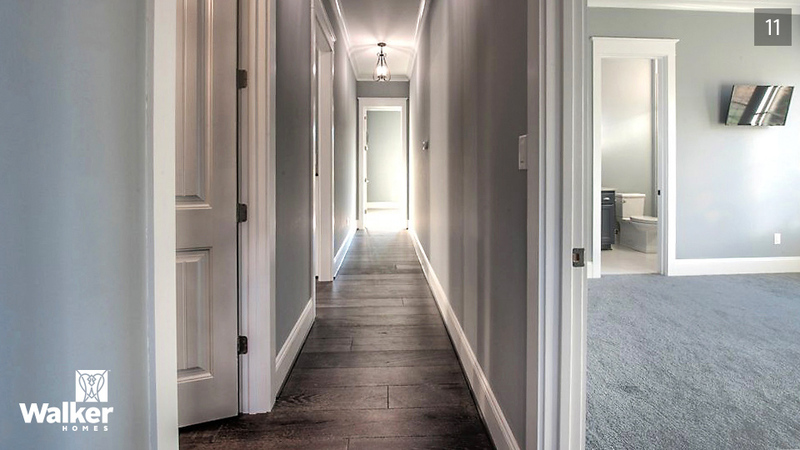 The hallway to the right leads past the home office, the stairway to the second floor, and kitchen pantry to the master suite. 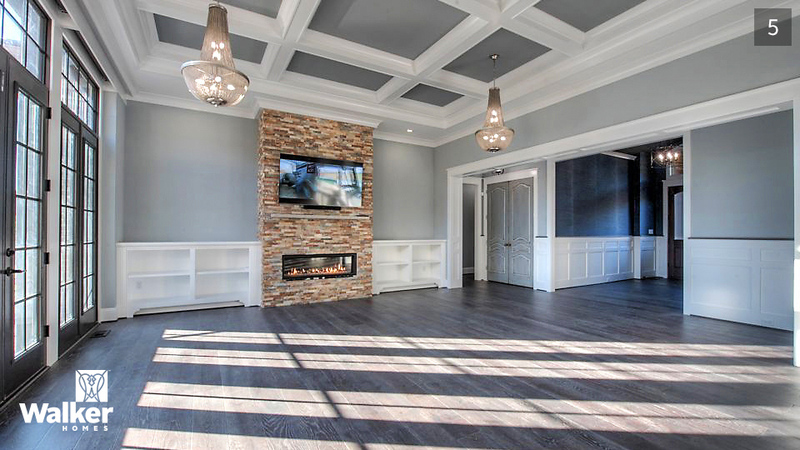 5 | To the right of the foyer, the great room features a large living area with a stone fireplace at one end and a kitchen and dining space at the other. 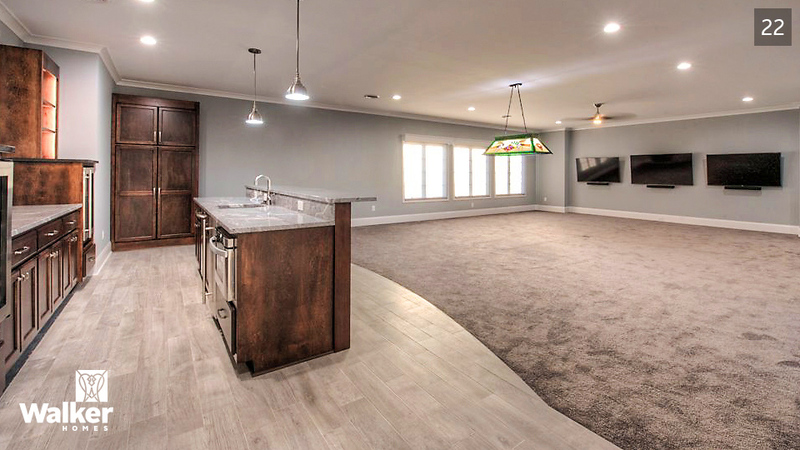 Through the faux antique doors is a media center that controls the whole-house stereo, a network of video screens, and other automation devices. 6 | Moving down the hall is the first of the kitchen/dining area cabinets next to a counter-depth Sub-Zero freezer. Behind the leaded-glass double pocket doors (our owners rescued the glass from a salvage yard) is the entrance to a pantry. 7 | Turn right into the kitchen; from left to right is a generous island with a seated bar, a Sub-Zero refrigerator, a built-in coffee maker, and a wall oven. The focal point is an antique cast-iron fire back Barb found in Europe, which our tile crafters embedded in the backsplash. 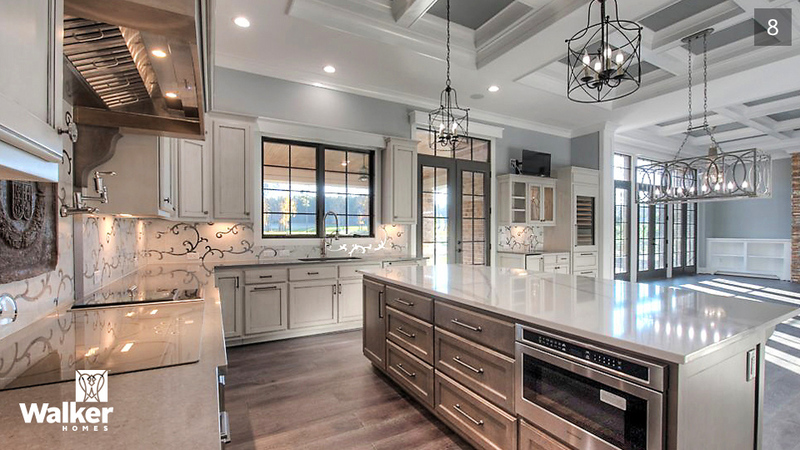 Under the hood is an induction cooktop, a steamer, and a traditional, wall-mounted pot filler, and—to the far right—the sink. 8 | Step behind the island to look down the opposite wall of the great room. The island includes a microwave drawer. 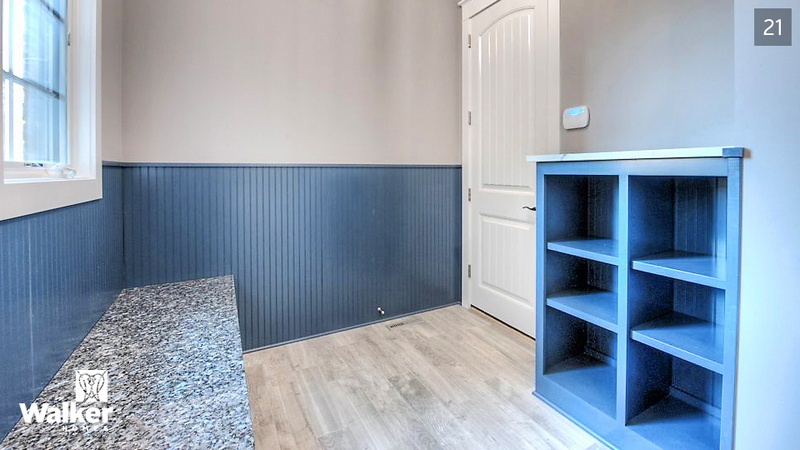 Against the far wall is a second sink, a wine cooler, and a well-hidden icemaker. Beyond that, the dramatic bank of doors and windows provide a gateway to, and views of, the porch, backyard, and golf course. 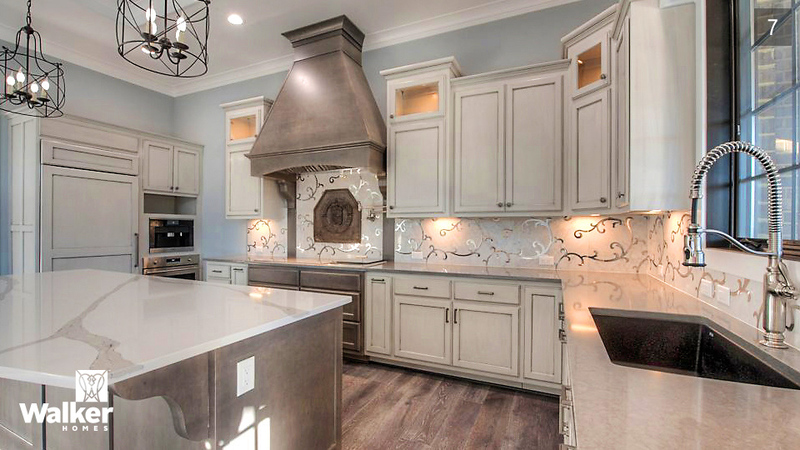 The countertops are a warm, light-colored quartz and the unusual backsplash is marble with a silver inlay. 9 | Looking past the pantry, the stairway, and the entrance to the office are the guest rooms. 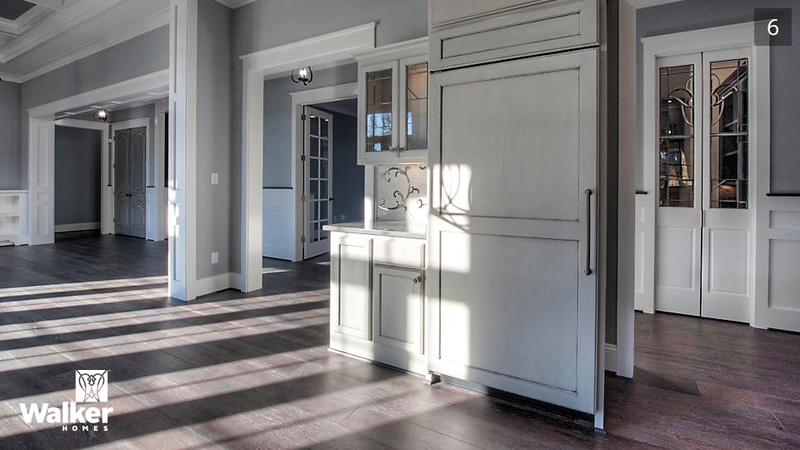 10 | The office features traditional French doors and a matching set of built-in cabinets. 11 | At the end of the hall is the powder room and three guest rooms. 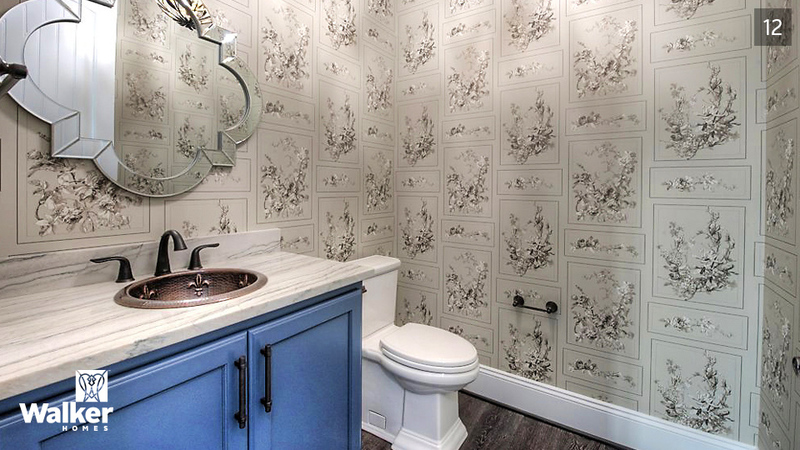 12 | The powder room is simple and elegant. 13 | Each guest room has its own closet and full bathroom. 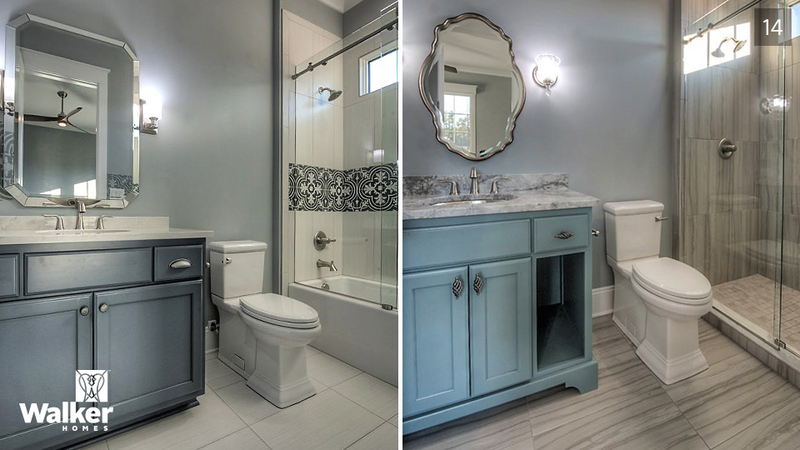 14 | Each bathroom has its own personality. 15 | The closets are large and well-appointed. 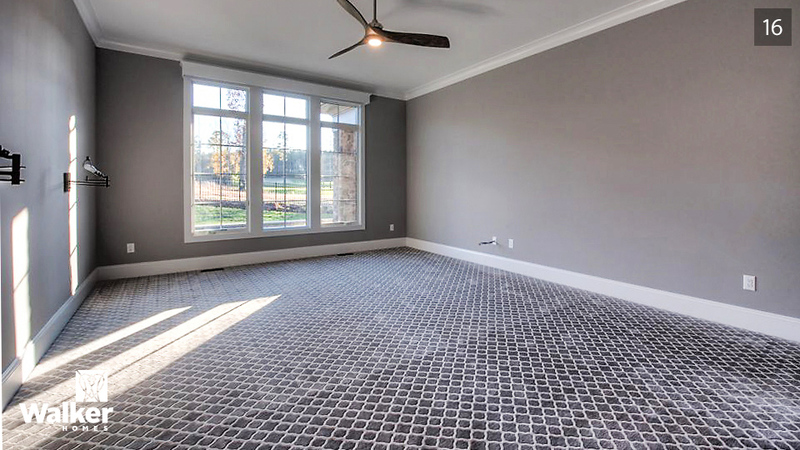 16 | On the opposite side of the home is a spacious master suite carpeted in a neutral trellis pattern. 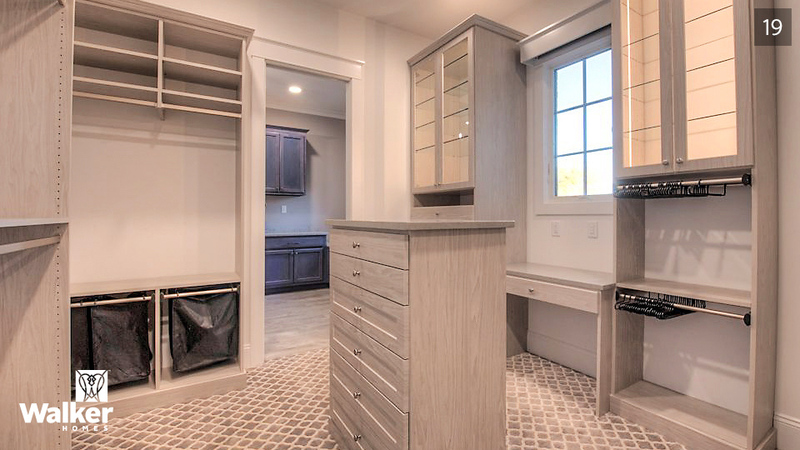 17 | The master bathroom enjoys a heated tile floor, his and hers custom-built vanities, a toilet room, and linen closet secreted behind pocket doors. 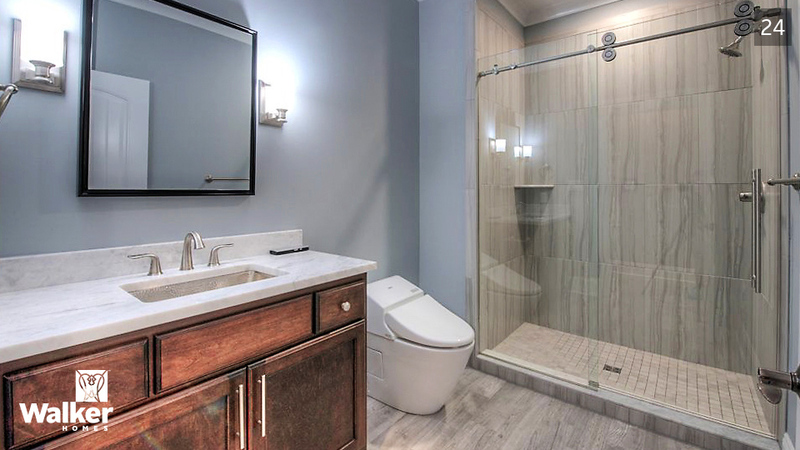 18 | Just behind you is a warm and welcoming shower space. 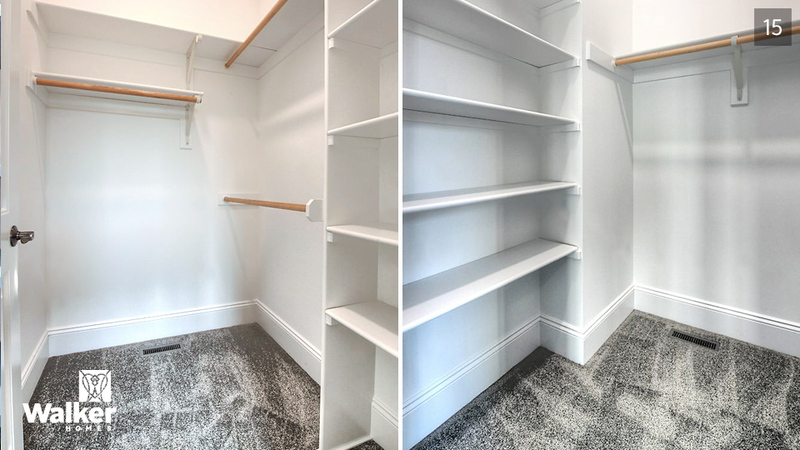 19 | Across from the bathroom is a dressing room with custom lighting and liberal amounts of wardrobe storage. 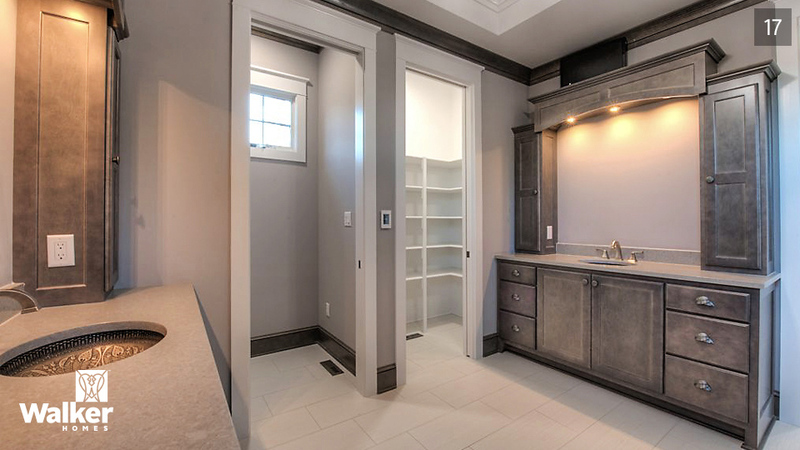 The door beyond provides a convenient entry to the laundry room. 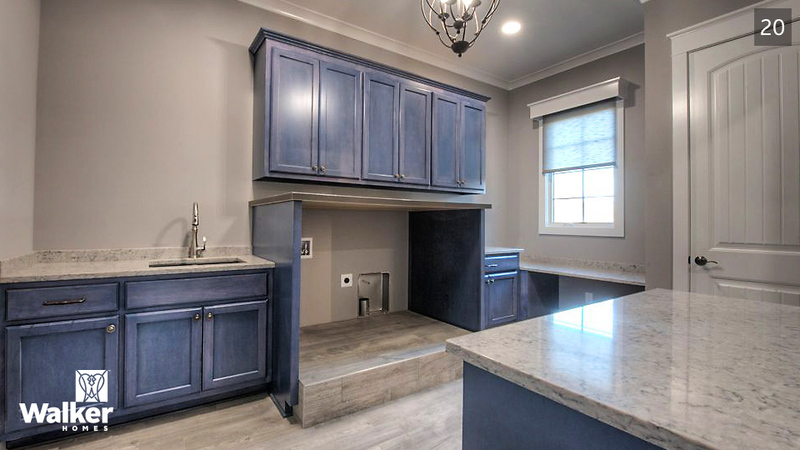 20 | The laundry room features a raised platform for a front-loading washer and dryer, a surface above it for folding clothes, a sewing table, storage, and a utility sink. See the valance across the window? Most valances throughout the house hide automatic remote-controlled shades. 21 | Just off the garage is the mudroom—the perfect spot for taking on and off shoes or boots and for storing outdoor gear. 22 | The second story holds the pièce de résistance—a large space for entertaining complete with its own kitchen, space for billiard table, and seating for a dozen or more in front of a bank of large video screens. 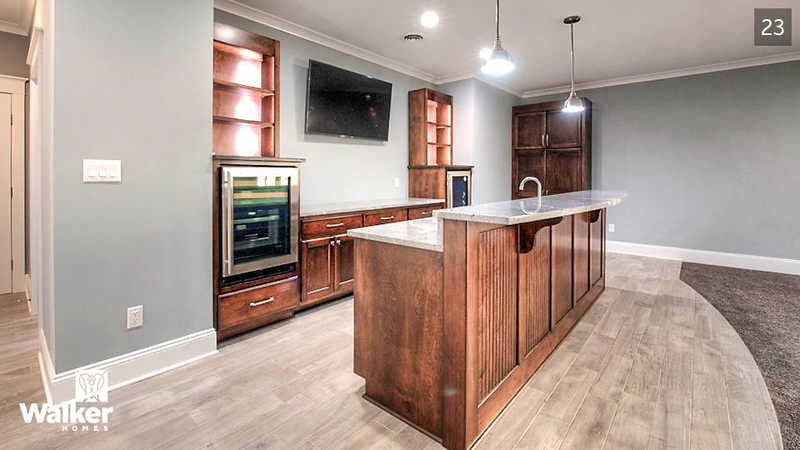 23 | The entertainment area kitchen has a beverage cooler, ice maker, microwave, dishwasher, and just out of sight, a modern dumbwaiter system for delivering supplies from the main floor. 24 | The entertainment space has its own full bathroom with a shower and a high-tech self-cleaning toilet. 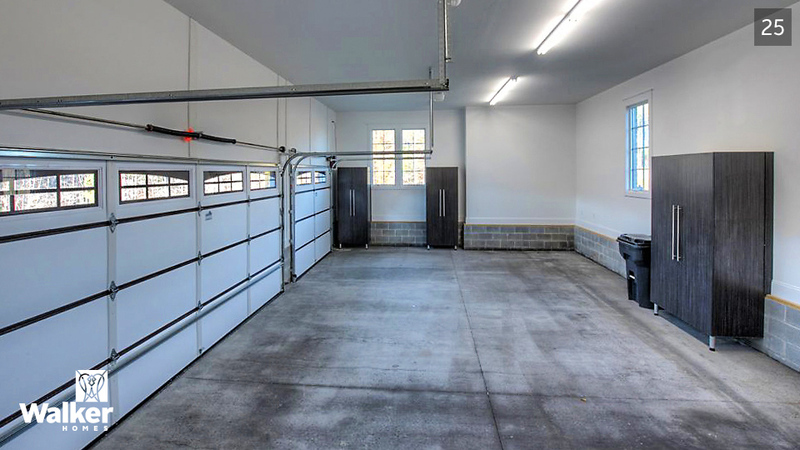 25 | The three-car garage is fronted with insulated steel doors and includes built-in cabinets for tool and equipment storage. 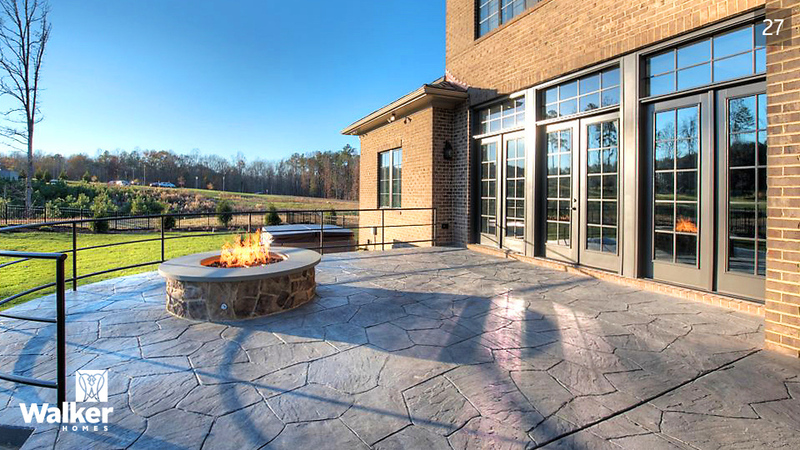 26 | Outside the great room is a stamped concrete porch with stairs that lead down and around to a whirlpool. 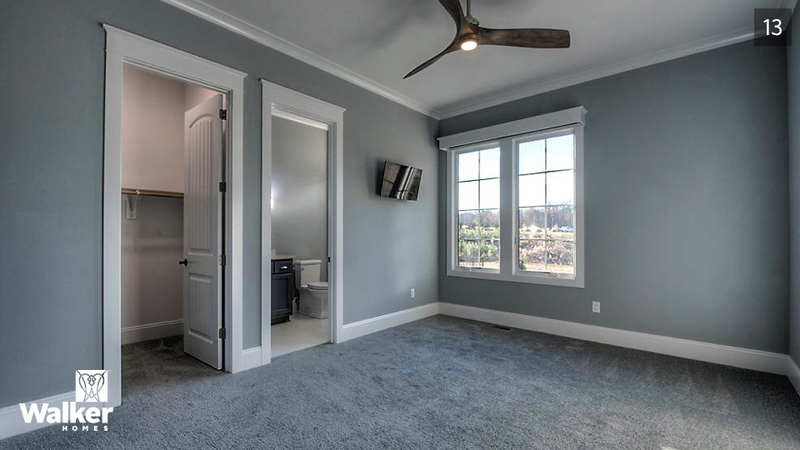 Just to the right, through the single outside door, is another unique feature—a porch powder room. 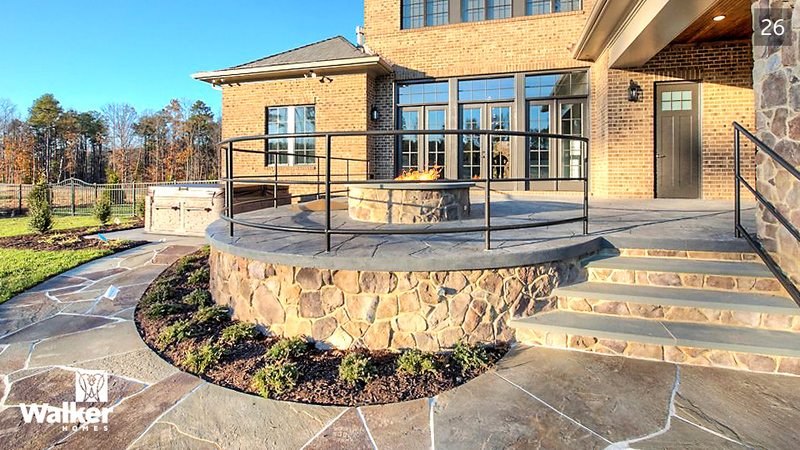 27 | The focal point of the porch is a 48-inch gas fire pit. 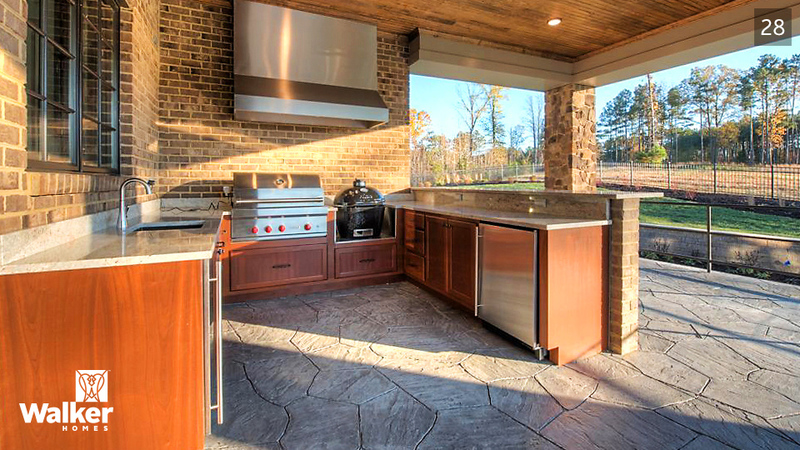 28 | Spin 180 degrees and you’re in the outdoor kitchen—complete with grill, smoker, sink, icemaker, fridge, and beverage cooler. 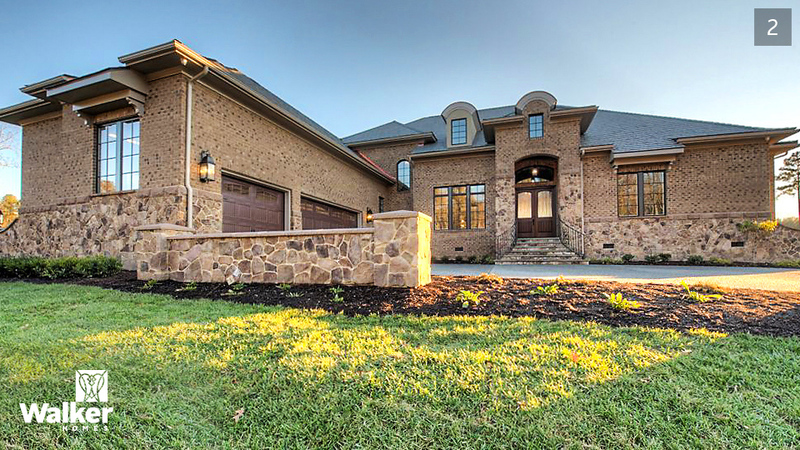 29 | The home is sited to offer restful views of the green fairway and the woods beyond. 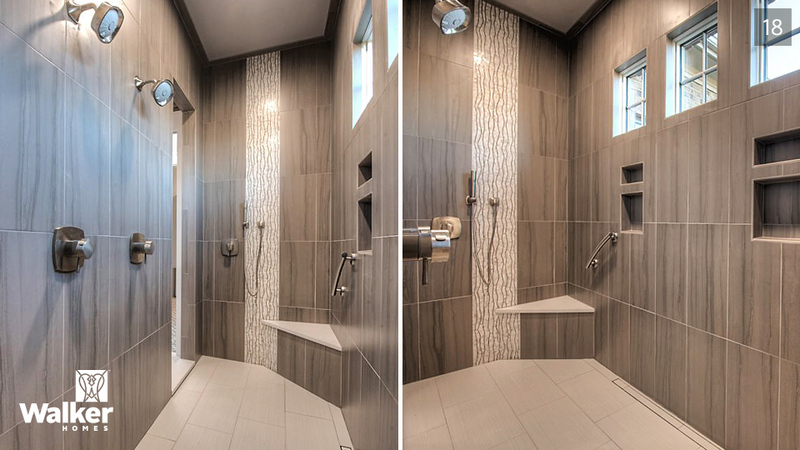 These are just a few of the amenities of a home we are particularly proud to have helped to design and build. Working with owners like the Harvills is more than an occupation—it gives everyone involved a real sense of accomplishment. But this is the Harvills’ dream—what’s yours? If you’re interested in bringing your ideas to life, we can tell you what it takes, how much it will cost, provide suggestions about where to build, and solve some of the other mysteries a home-building project presents. 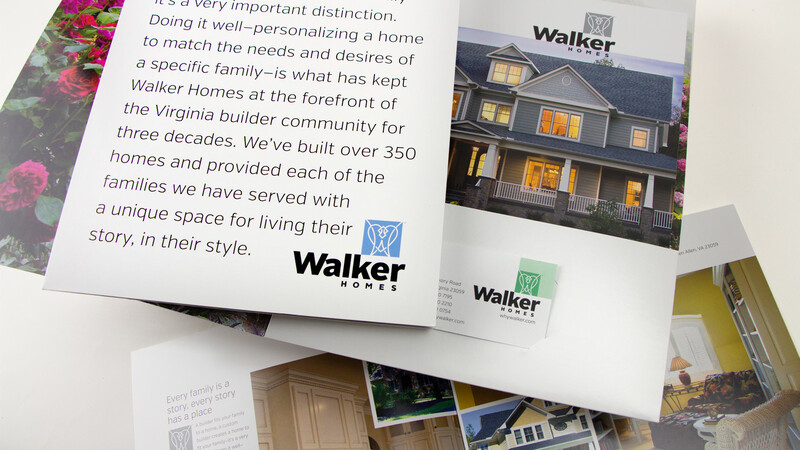 May I send you a copy of the Walker Homes Introduction Package? It includes some of the homes we’ve built, explains our business, and introduces our A-list of partners. For your copy, please call with 804 270 7195 or email your request to info@whywalker.com (with your name and street address). Ready to talk? I’d be happy to discuss the possibilities with you.